V I TA L S TAT S PracticeLink.com W INTER 2018 35 Huntsville Hospital, the second largest hospital in Alabama, is a 941-bed hospital that serves as the regional referral center for north Alabama and southern Tennessee. Huntsville Hospital is Alabama's Only Top 50 Heart Hospital, Top 100 Spine Surgery Centers and a Women's & Children's Hospital with a St. Jude Affiliate Clinic. Huntsville is the fastest growing city in the state and among the fastest in the Southeast. Huntsville is also home to the highest number of PhD's per capita in the nation - one of Forbe's Top Ten Smartest Cities in the World. Cardiac Anesthesiology Cardiology Emergency Medicine Family Medicine Gastroenterology Hospitalist/Nocturnist Neurology Occupational Medicine Oral/Max Surgeon Pediatric Critical Care Pediatric Hospitalist Pediatrics-Emergency Medicine Pediatrics-Neurology Pediatrics-Surgery Physical Medicine & Rehab-Physiatry Pulmonary Critical Care E xperience. The Difference. KIMBERLY SALVAIL, AASPR, PHYSICIAN RECRUITER 256-265-7073 • kimberly.salvail@hhsys.org www.huntsvillehospital.org PHYSICIAN OPPORTUNITIES Located in the Texas Midwest just two hours west of the Dallas/Fort Worth metroplex, the city of Abilene offers a high quality of life and low cost of living. It's a great and safe place to raise a family - a small town atmosphere with all the big city conveniences. Abilene has a population of 120,000 and a surrounding service area of nearly 400,000. Income Guarantee: • Attractive one-year guarantee • Sign-on bonus • Relocation assistance • Potential for monthly stipend final 24 months of training • Practice start-up assistance Live•Work•Relax•Play. Finding Balance Practice medicine in a place that's good for the soul. Employment Opportunity: • Great yearly salary + lucrative incentive program • Sign-on bonus • Competitive benefit package • Relocation assistance • Marketing • Potential for monthly stipend final 24 months of training • Student loan repayment • Malpractice coverage www.ehendrick.org Hendrick Medical Center has 522 licensed beds and is among the highest in the nation for patient satisfaction. Hendrick is a nine-time Gallup Great Workplace Award winner and is recognized by the Texas Nursing Association as a Nurse-Friendly Hospital. As the second largest employer in the city, almost one-third of the 3,000 employees have worked at Hendrick for 10 years or longer. Rachel Lee – Physician Recruiter 325-670-6275 – rlee@ehendrick.org Brittany Adair – Physician Recruiter 325.670.6276 – badair@ehendrick.org does that number correspond to the number of opportunities available? That's where the PracticeLink Physician Recruitment Index comes in. The Index is a relative indication of the ease or difficulty of job searches in various specialties based on supply and demand information gathered by the PracticeLink system quarterly. The larger the "Jobs per candidate" number for your specialty, the better your potential standing in the market. The change in rank ref lects the specialty's movement since last quarter. 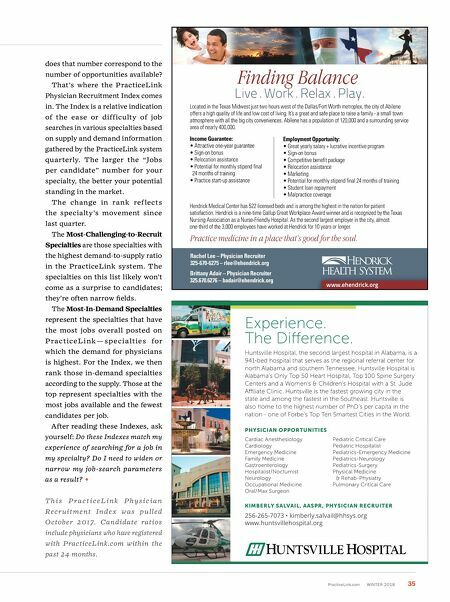 The Most-Challenging-to-Recruit Specialties are those specialties with the highest demand-to-supply ratio in the PracticeLink system. The specialties on this list likely won't come as a surprise to candidates; they're often narrow fields. 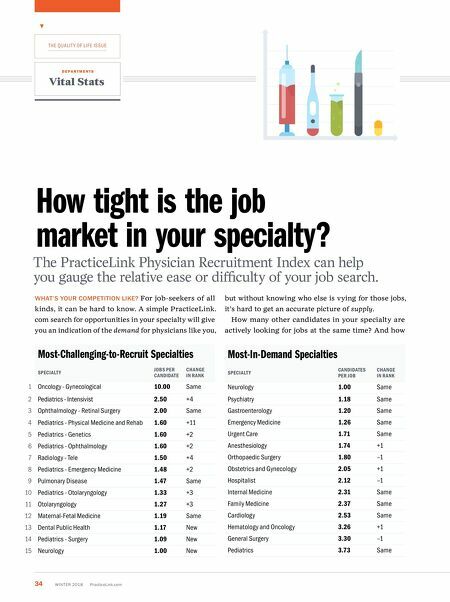 The Most-In-Demand Specialties represent the specialties that have the most jobs overall posted on P rac ticeLi n k — specia lties for which the demand for physicians is highest. For the Index, we then rank those in - demand specialties according to the supply. Those at the top represent specialties with the most jobs available and the fewest candidates per job. After reading these Indexes, ask yourself: Do these Indexes match my experience of searching for a job in my specialty? Do I need to widen or narrow my job-search parameters as a result? T h i s P r a c t i c e Li n k P h y s i c i a n Recr uitment Inde x wa s pulled October 2017. Candidate ratios include physicians who have registered with PracticeLink.com within the past 24 months.